What if you could plant your vegetable garden one year and not need to replant it for years to come? Perennial vegetables can make this dream-garden a reality. Perennial vegetables only need to be planted once and then come back year after year for you to harvest without any additional planting. Planting an annual vegetable garden like this one can be a lot of work. Imagine getting this without planting every spring, while also reducing pest numbers, watering less and improving your soil. Can you really plant only perennial vegetables in your garden, so you only need to plant once? Of course, this would involve changing what you eat a fair bit. But you can replace a lot of your traditional annual vegetables with perennials without too much of a dietary shift. This will reduce how much you need to plant each year and saving you time. So why don’t you see more people planting perennial vegetables in their garden? A lot of it comes down to a lack of knowledge about perennial vegetables. When you go to the grocery store—or even the farmers market—asparagus and rhubarb are probably the only perennial vegetables you will find. I'm going to make sure you have all the information you need to start growing perennial vegetables. But I know it is a lot to take in. Don't worry—I made a print-friendly cheat sheet to make sure you have the tools you need to plant perennial vegetables, to grow more food while saving you time. What Does “Perennial” and “Annual” Even Mean? Are You Familiar With Perennial Vegetables? 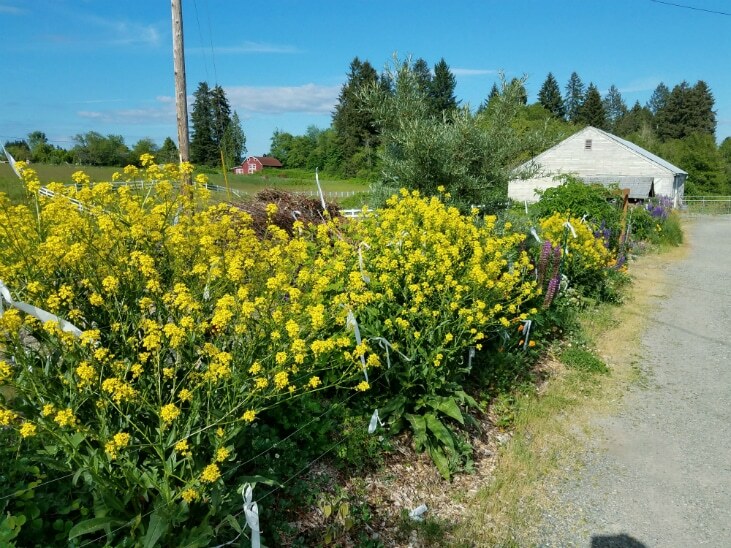 Before we dive into perennial vegetables, I want to make sure you understand what we mean when we talk about perennials or annuals in the plant world. Understanding these three words will help you choose the right plants for your garden. If you want to learn more about the pros and cons of perennial, annual, and biennial plants and when to use them in your garden check out my blog post: 3 Plant Types You Need to Know: Perennial, Biennial, and Annual. Annual plants such as the ones in this container garden are often found in vegetable gardens. Annual plants grow, produce seeds, and die all in the same year. The vegetables you see in grocery stores are often annuals. Plants like lettuce, spinach, and tomatoes are common annuals in areas with cold winters. Annual vegetables are the mainstay of any traditional vegetable garden. They’re the vegetables people are most familiar with, but they also take the most time and energy to grow. You spend a lot of time planting them in the spring, and then you have to start all over again the following year. Annual plants grow, flower, produce seed/fruit and die in just one year. This means they must be replanted every spring. I grow perennial Turkish rocket in my hedgerows as a perennial vegetable. It also attracts large amounts of beneficial insects when flowering and while flowering it gives off a very nice scent that wafts through the air. Perennial plants are plants that live for longer than two years. Some are short-lived and may only last for 3 to 5 years, but many, like trees and shrubs, can live for decades. Now think about your garden. Imagine planting a vegetable once and being able to harvest for years to come without having to replant. Of course, there are some trade-offs. Most perennial vegetables will be new to you. While many can be used as substitutes for common annual vegetables, the taste and texture will not be exactly the same. Perennial vegetables also take more time to get established. It can take 1 to 3 years before they start providing a large harvest. You have to be more patient when establishing perennial vegetables, but they pay you back later. But perennial vegetables do more than just save you time and energy. They also need much less water than annuals. That’s because perennials have years to establish much larger root systems. This larger root system can better draw in water and nutrients for the plant. Perennial vegetables also minimize disturbance to the soil, since you don’t need to plant each year. Along with other practices like mulching, this will promote soil life. Plus, perennial vegetables also help to attract beneficial insects which can reduce your garden pests. All of which will further improve the resiliency of your garden. So are you ready to add perennial vegetables to your garden? Remember—you don’t have to replace all your annual vegetables to get some of the benefits from perennials. Let’s dive into perennial vegetables and see what types you can grow. Requires little watering once established. Provides harvests year after year without replanting. Once established can provide large harvests. Require much less work than annual and biennial plants. Can attract beneficial insects and help build soil. Less flexibility since you don't replant each year. May require some adjustment in your cooking and eating habits. Tend to take up more space per plant than annual and biennial plants. May not produce a harvest during the first 1 to 3 years. What first come to mind when you think of edible perennial plants? Fruit trees, herbs, and berries. If you go to the super market to buy vegetables, or even the farmers market, chances are that you won’t find many perennial vegetables unless you’re in the tropics. What if I told you there are dozens of perennial vegetables that you can grow in your garden? Enough to fill a book! Eric Toensmeier’s excellent book, Perennial Vegetables, lists a wide range of perennial vegetables in all climates within the United States. The book also provides wonderful resources to help you find perennial vegetables to buy in your area along with design tips to help you plant them. Each section of the book highlights a different family of perennial vegetables, explaining how to grow, harvest, and use the plant. These sections also show you where the plant will grow outdoors within the United States. I highly recommend buying Eric Toensmeier book if you want to grow perennial vegetables in your garden. While you may not be familiar with them, there are dozens of perennial vegetables to choose from. Keep reading to see some examples! Look up your USDA Plant Hardiness zone before you pick out your perennial vegetables. Screenshot from USDA Washington State Plant Hardiness Zone static map. Before we take a look at examples of perennial vegetables, make sure to check your USDA Plant Hardiness Zone to help you determine which perennial vegetable will survive in your area. Your USDA zone is based on the maximum average cold temperature your area reaches each year. It doesn’t tell you anything about your summer temperatures or rainfall patterns. But since perennials have to be able to survive the winter chill, it’s an important factor when picking plants to try out. Plants are not limited to a single zone. A general rule is that if your zone is lower than the lowest zone listed for the specific plant, that plant probably won’t survive your winter. So, if a plant is listed as zone 5-7 and you are in zone 4, the plant won’t make it. Zone 8 might be fine, but some plants may need colder winters than the average winter in zone 8 to produce seeds or fruits. Look up your climate zone at the USDA's Plant Hardiness site and plant plants that are listed for that zone. Below, you’ll find a list of some perennial vegetables to whet your appetite and give you an idea of what is possible. Of all the perennial vegetables in this list, this is the one you are most likely to have seen in a grocery store. The stems of rhubarb are edible, but the leaves have too much oxalic acid in them to be eaten. You can use the stems for a variety of cooking recipes, like rhubarb pie! Rhubarb is a great perennial vegetable to add to your garden. Note: Details like USDA climate zone may vary depending on specific variety purchased. I’m very excited about this plant. I’ve often grown kale in my garden, but like most greens it needs to be planted every year. Here comes kosmic kale™ to the rescue! Unlike normal kale, this variety is a perennial that can provide year-round harvests. It’s also an attractive addition to the garden. The video is a bit rough but gives you a good up close view of this plant and mentions how it can be propagated. Note: As a green this plant can be harvested during the first year, but leave enough leaves to keep the plant growing. Don't harvest all the leaves at once. A traditional food crop in Europe, this plant can be eaten in different ways. Young shoots: Used like asparagus (another perennial vegetable!). Leaves: Used like spinach but with a slightly peppery taste. Flowers: Harvested before they open and used like broccoli. Note: Potentially difficult to grow from seed. Some sources state it is easy to grow from seed while others say it is difficult. But once established it can be propagated by dividing established plants and will likely spread by seed. Like kosmic kale™, this is a perennial variety of a vegetable you may already know and love. Purple tree collard can be used like any other collard, and it’s often thought to taste better! Be aware that this collard does tend to grow big, sometimes growing over 8 feet tall! The video above will give you a better look at tree collards and how to control their growth. I have been growing this perennial vegetable for a couple years in one of my living fences or hedgerows. Some people like this plant a lot, but I’ve heard from others that aren’t as fond of it. There seems to be a lot of variation between different varieties of Turkish Rocket. It has a distinctive taste, but my wife and I enjoyed them lightly sauteed. Plus, the flowers smell great and attract pollinators. Oca is a very interesting and beautiful root crop from the Andes, from same region that gave us the potato! Now, is a root crop a perennial? This is a bit of a grey area but if you are in a mild climate like the west coast of Washington State you can plant Oca tubers back in the ground as soon as you harvest them. Because harvesting and planting can be done at the same time, I tend to count these as perennials – if you did not harvest them they would come back on their own the following year. Oca can be used like a potato, and if you let the harvested tubers sit in the sun for a couple weeks they become nice and sweet. Note: Below zone 7 the tubers can be dug up and replanted in the spring. Similar to potatoes. Tubers are not harvested until mid/late fall. This list of perennial vegetables is just a small taste of what you can grow in your garden. If you are inspired to try these out, make sure you check out Eric Toensmeier’s book Perennial Vegetables. You can also go to his website to see perennial vegetables listed by climate. But the website only provides a general list—you have to buy the book for the plant descriptions. It really is a treasure trove of information and worth keeping by your side as you continue down this path. My hedgerow served as a vegetable garden during its first year with a mix of perennial, and annual plants. You might be thinking, Okay, all these perennial vegetables look great but how do I fit these into my garden? If you’re used to seeing people planting their annuals in one area, their herbs in a separate one, and their berries and fruit trees off in a different area, it can be hard to imagine how to work these into the mix. Rhubarb and other similar perennial vegetables that don't spread would be great to add to the ends of your existing vegetable beds. Image by daryl_mitchell CC BY-SA 2.0. If you have an existing annual vegetable garden, you can try adding a few perennial vegetables to the ends of your existing rows or along the edges of your beds. I once planted a bunch of perennial herbs along the base of a large wooden raised bed. The same could be done with perennial vegetables. This would let you test out some perennial vegetables without fundamentally changing your garden. 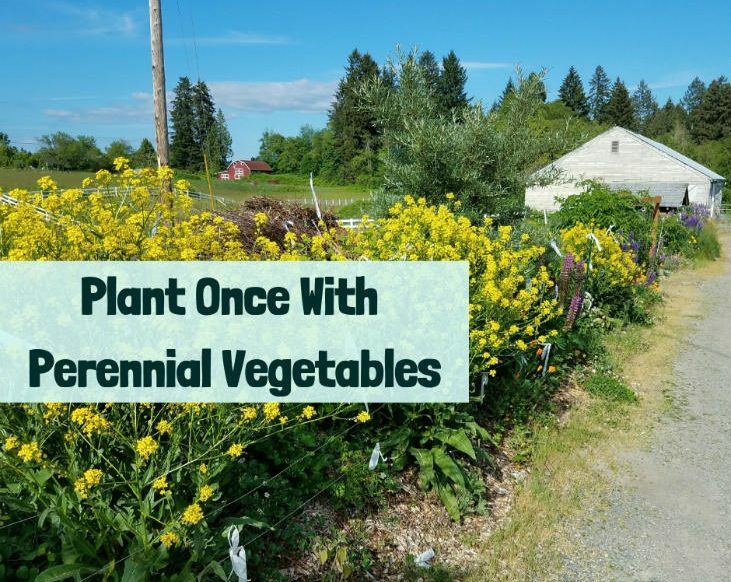 You won’t gain all the benefits, since you will still be planting all your annuals each spring, but you can learn which perennial vegetables you like and which you don’t. Pick perennial vegetables like rhubarb or sea kale that don't spread and stay relatively contained to plant on at the ends of your existing garden beds. The next step would be to start mixing in the perennial vegetables into your garden beds and rows, intermixed with your other vegetables. Perhaps you could grow kosmic kale™ where you are already growing regular kale. This gives you more benefits by letting you start replacing some of your annual vegetables with perennials that you don’t have to plant each year. Over time, you can replace more and more of your annual vegetables until you find the right balance for your garden. A great example of how this planting style works can be seen on One Yard Revolution, one of my favorite garden channels on YouTube. Patrick has an amazing mix of annuals and perennials in his small USDA Zone 5 urban Chicago backyard. Check out the video at the top of this section which really showcases some great ways to mix perennial vegetables with your annual vegetables. 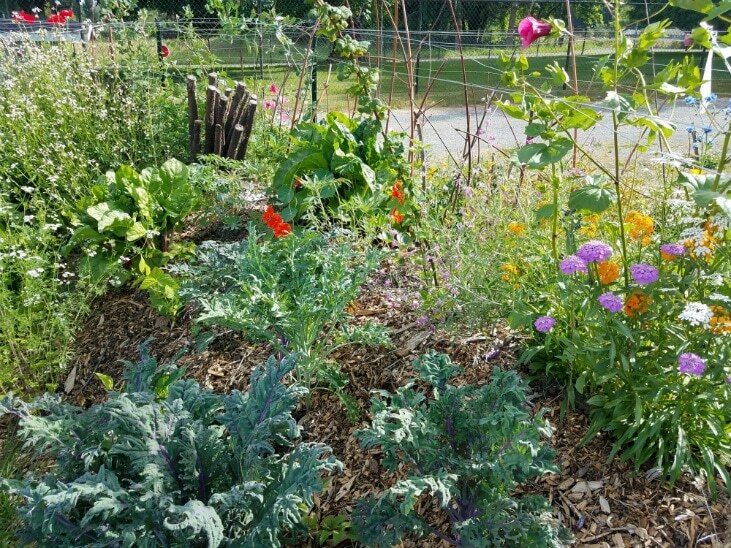 Replacing regular kale with perennial kosmic kale™ is a great way to start mixing perennial vegetables in your garden without drastically changing your beds. Look for other perennial vegetables that can easily replace an annual as an easy way to start including more perennial vegetables in your garden. I mixed Turkish rocket in my perennial hedgerow. This let me harvest cooking greens and flower heads (like broccoli) from the hedgerow. I also planted sea kale which is another great perennial vegetable. You can also add perennial vegetables to your existing perennial areas–where your trees and shrubs are. This can be especially useful in front yards, where you may not be allowed to have a traditional garden. But very few people will know you are growing vegetables if you just mix in a few perennial vegetables amongst your roses or other ornamental plants. If you have fruit trees and berry bushes already growing on your property you can easily mix in some perennial vegetables. Treat the perennial vegetables the same as you would an ornamental flower or shrub – just don’t forget to harvest it! If you have shrubs and trees already established just add some perennial vegetables around them. This will give you an easy source of new vegetables to harvest with minimal work. Growing perennial vegetables can really take your garden to the next level by growing more food, using less energy and taking less time. In this post you have learned the difference between annual and perennial plants, what perennial vegetables are, and how to incorporate them into your existing garden. This post also provided you with a starter list of perennial vegetables to help you get started growing perennial vegetables. Now it is up to you to take the next step to save time, and energy by planting perennial vegetables. For more information don't miss my post covering 11 Perennial Greens that would make a great addition to a salad or as cooking greens. Add in some perennial root vegetables and you got the start of a complete meal. But I know it can seem overwhelming, so please don’t forget your free print-friendly companion cheat sheet to this article. What perennial vegetables are you going to try first? Let me know in the comments. I’m excited to hear from you! Already growing perennial vegetables? I’d love to hear about your experience and your recommendations. Please leave a comment and share! This post was shared on the Simple Homestead blog hop and the Homestead blog hop. I love perenial veggies and wish I had more varieties! But, the ones that I do have, I dearly love! I really want to find a source of tasty miners lettuce. The Siberian Miners Lettuce that grows on my property tastes strongly of dirt :(. That is a great list of yummy perennial veggies. Bunching green onions and walking onions are on my list to get started at my homestead. Have you enjoyed cooking with them? I purchased miners lettuce seed last year from Territorial Seed Company and it came up easily in my hedgerow. Plus, they tasted really good in salads! I’m already getting volunteers coming up! You might try getting a pack of seeds from them.